Revisit your past: Dianara v1.2.4 is out! The main new features are the page selector, which you can use to jump to any page in your timeline (you can go to your first post directly, for instance), and the (optional) snippets in the Meanwhile feed. By default, snippets for the activities will be shown when the activity is highlighted, except if the activity is yours. This mostly means you’ll be able to see a part of a comment to one of your posts, or a comment matching one of your highlighting filters, for instance, directly on the side panel. Optional snippets in the Meanwhile feed, with configurable character limit. Clicking the button that shows the page number at the bottom of a timeline (or pressing Control+G) will open a window to jump to any page. Menu option to enable/disable timeline auto-updating. New status bar icon indicates initialization stage and state of auto-updates. Clicking it will also toggle the state of auto-updates. Tray icon shows how many of the new messages are also highlighted. Names of recipients are shown as links in the Publisher, so hovering over them will show their addresses in the status bar. More logging, specifically during initial client registration and the authorization token process. Settings dialog switched from tabs to stacked view, to have more categories in the future. Added a TRANSLATING file, with instructions for new translators. Fixed quoting texts containing “<” and “>”. Other small visual changes and fixes. 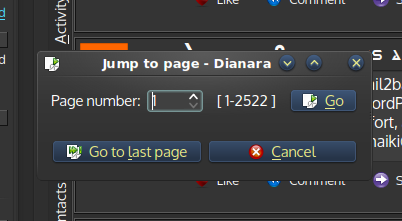 Dianara 1.2.4 is available in English, Catalan, Spanish and Italian languages. Partial German and Polish translations are included. 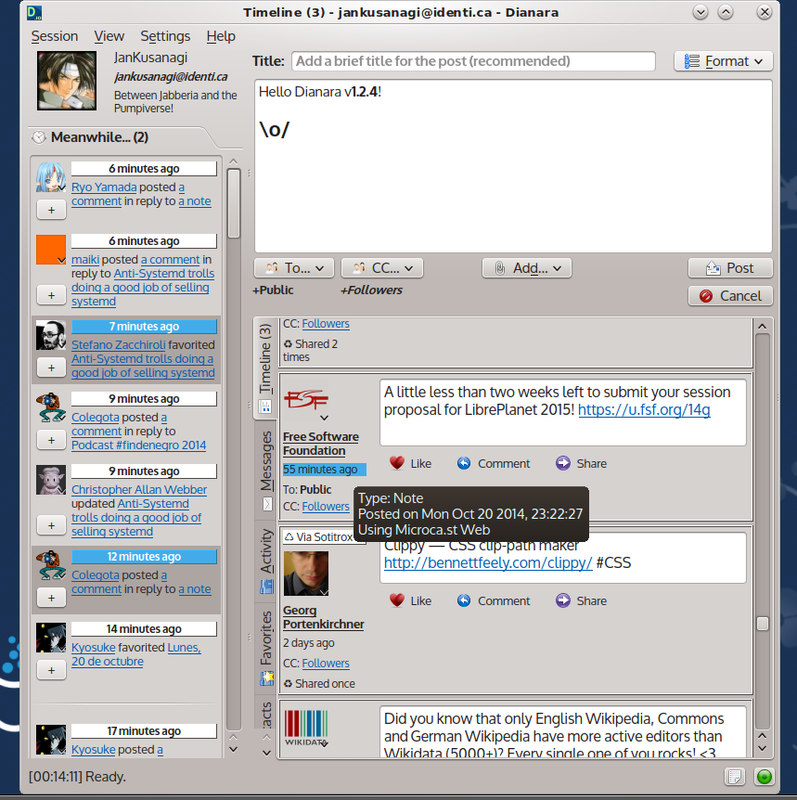 You are currently browsing the Jan+KDE blog archives for October, 2014.